The one thing that always makes me fall in love with my country – New Zealand – is the support and love we give each other in times of crisis. Strangers come together, families reunite, people we have only just met become our closest friends, and the degrees of separation become even smaller. Last week New Zealand was shattered by the Christchurch earthquake which is set to become our little country’s worst natural disaster. Christchurch was already pummelled by the September 4th 2010 earthquake which miraculously saw no one killed. Unfortunately this time we have not been so lucky. The news items are horrific, the newspapers are full of stories of suffering, loss, and unbelievably, scum of the earth who have been stealing emergeny generators, looting and burglarising. This aside, the amount of people desperate to offer some form of help is astounding. Charities are asking people to stop donating goods as they’re overwhelmed. NZ Blood has stopped accepting donations because of the incredible response. Aid organisations are asking people to donate money and people are listening in huge numbers. Christchurch Baking Army: At the time of writing this, the Christchurch Baking Army had baked and delivered an incredible 4,060 baked goodies for distribution to the people of Christchurch. Great Palmy Bake Off: People all around the country are getting their bake on to raise funds for the Red Cross Earthquake Appeal. Love thy neighbour has never had more meaning! Get Your Bake On: The awesome people at Delish Cupcakes have organised a bake sale in Auckland for the 5th March. So far more than 300 people on Facebook are attending. The Great Sunday Bake Off: These creative cats from Wellington launched a flurry of baking activity by organising to drive to Christchurch with a truck loaded of donated baked goods. One of the comments which made me melt like chocolate icing reads: “there was just so many people handing in icecream containers of cookies, men in business suits carrying chocolate cakes, little kids in school uniform with biscuits, etc etc, it makes my heart strong to see the love for fellow beings in need” – too right. Water for Christchurch: With water supplies cut to a huge percentage of households and the water available not safe for drinking, George FM encouraged people to drop off bottled water to take down to Chch. 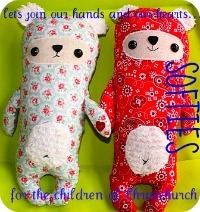 Softies for the Children of Christchurch: This super sweet lady has come up with a way to show her support by banding together with a bunch of like minded individuals to knit, sew and crochet toys for little nippers affected by the earthquake. Help Christchurch stay in touch: Even big business is getting involved. Telecom is asking people to donate old analogue telephones that don’t need power to operate. The point to all this is that wherever you are and whatever your situation, there IS something you can do. Kiwi ingenuity and togetherness prevails and above all, so does the human spirit of wanting to help those in need. Although our hearts are heavy for the people in Christchurch, we can be comforted knowing what an amazing country we live in and knowing that we’ll all get through this. Kia Kaha Christchurch. Categories Feel good. Do good.